I wrote a piece about Rupert Murdoch a couple of years ago, because he’s a fascinating character. At the time I wondered what had happened when Pluto went over his Ascendant — and how come he was still standing – since he seemed to be doing OK at that moment. Then the sh*t hit the fan with the hacking scandal, and the closure of The News of the World and now he’s getting divorced. 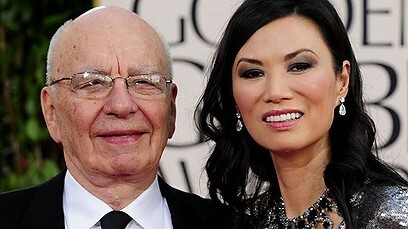 He’d married Wendi Deng when Pluto was in conjunct that Jupiter in the 7th house. He’s divorcing her as Pluto, still in the first, opposes his natal Jupiter in the seventh house of partners. She is a Jupiter-ruled Sag – and clearly likes to gamble for big stakes. The thing about Murdoch is that he is very serious about his family and the legacy he leaves his children — fourth house Sun-Mercury in Pisces, Saturn in the first/second in Capricorn sextile Sun. This is key to his character. If Deng failed to make him feel that she and her girls are family, he will want to ensure that there will be no legal issues about his legacy. He will have been planning this divorce for a while, making sure all the legals are tight, so his other children will be sure to keep control of the empire. Apparently it’s all in trust, but Murdoch knows better than to trust anyone. If he’s divorced when he dies, Deng won’t be able to challenge his will. Today, Mercury – the news – is right on his Pluto. This summer’s astro-splurge puts Murdoch’s Jupiter right in the eye of the storm. It’ll be interesting to see how this unfolds. He may well have met an enemy as ruthless as he is himself. I note that he has Lilith on his IC: wild woman undoing his foundations perhaps. To read the profile of Murdoch and see his chart, click here. Wonder what his Uranus Return will bring next spring w/the 5th exact Uranus-Pluto sq at 13° on 21 April? I know. She’s just right astrologically speaking,isn’t she. He was never going to end up with anyone… nice. The Uranus Return is imminent.- and again absolutely in the line of fire. Could be something to do with his kids. Wonder if she’s pregnant, despite precautions. That would change things. he certainly will experience an interesting summer. How about the 27th August ? He will have Neptune opposite his natal Neptune and Jupiter conjunct his natal Jupiter ! I believe he married Wendy Deng 11 years ago ?? (one Jupiter-transit). And Uranus will almost conjunct his natal Uranus. On the other hand he will have Black Moon Lilith on his Descendant and Chiron conjunct his Black Moon Lilith. Mars/Pallas will be conjunct Osiris and Atropos conjunct his natal Jupiter. And I think there must be even more important aspects this summer. Hmm – I need to go check the wedding dates, because he would have married her with Pluto still in the 12th in that case. I found on the internet he got married to Wendi Deng in 1999, so that is 14 years (a half Saturn transit!). It will still be an interesting summer. Yes, I’ve recast the chart and corrected the piece. In fact, Pluto was quincunx the Jupiter when he married her! So he’s been married to her for the passage of Pluto from one sign to the next to the same degree. That’s interesting. I fell sure that this is a Pluto-Jupiter thang. With Jupiter as part of this big astro-jamboree this summer, who knows what could explode. And who better to make an open enemy than a former wife! Your profile is totally fascinating. Do you think capricorns will be feeling divorce pressure on a whole with cancer transiting their seventh house in cancer and Pluto transiting their first house on their sun? Interesting question. I think any problems that are already existing will become much much bigger. That’s really interesting re: his divorce transit. I wonder if many capricorns are going to feel divorce pressure with Jupiter moving into the seventh in cancer and Pluto continuing it’s transit of the first house in Capricorn. Sorry just saw your comments. I think this is you again. Happy midsummer.